THE “Battle of Alberta” dates back to more than a century ago, supposedly to an 1892 rugby game between Edmonton and Calgary. This rivalry ignited a legacy of athletic competition between the two cities, spawning colourful nicknames meant as insults. We called them “horse country” and “the cow camp,” and they went with “Eskimos” for us, because of our northern latitude. The name stuck. And although Edmonton’s had football clubs called the Eskimos between 1895-1923 and 1929-39 (as well as hockey and baseball teams that used the same moniker), the current franchise was not established until 1949, one of the youngest in the Canadian Football League. And ever since then, they’ve been the victors in this historic provincial clash. 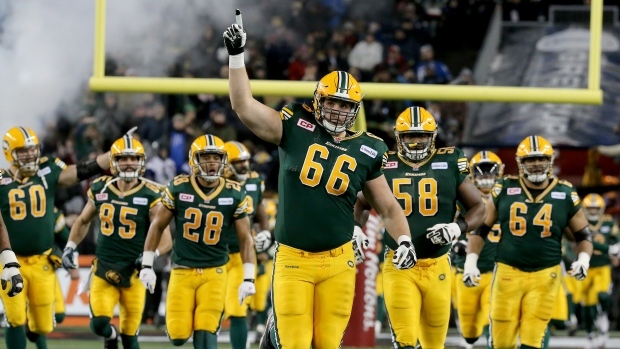 For 34 years in a row (1972-2005), the Edmonton Eskimos qualified for the playoffs of the CFL championship, more than any other North American professional sports team...ever! They captured 14 Grey Cup championships (& nine runner-ups) since their inception: 1954-56, 1975, 1978-82, 1987, 1993, 2003, 2005, and most recently in 2015. Only the Toronto Argonauts - who have 76 years on the Eskimos - have won more, with 16.